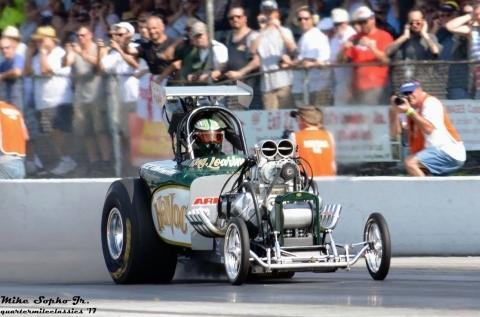 The 15th annual Holley National Hot Rod Reunion presented by AAA Insurance was held on June 15-17 2017 at Beech Bend Raceway Park in Bowling Green, Kentucky. 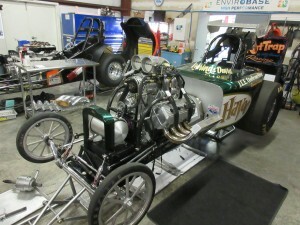 Rob Loaring and Nick Davies took the Havoc Fuel Altered as part of their 2017 US tour. This is Rob's account of events that weekend. As well as a list of sponsors to acknowledge, Rob thanks team members Scott Barnes and Jack Petley who also took many of the photos. With the car based in Tennessee, our 2017 season was inevitably going to present a few problems. The routine service work, usually taken care of in a few hours here and there, became the first. The options were to either work through it at the track, when we were fresh off the plane, or one of us would need to fly out early and get the work done at Rat Trap HQ. For the Bowling Green event we concluded that for yours truly, the job list was large enough to justify an early departure. There was nothing of any real consequence, the clutch pack needed changing, the clutch can needed some threads taking care of and was also due for a new liner. We had some shorter wheelie bars to fit, a new driveshaft to sign off and a crack in the fuel tank to take care of. Most of all, the Bakersfield race had given some concern over the steering. None of these jobs would present any problem at the teams shop but might have proved difficult with the limited resources available at the track. 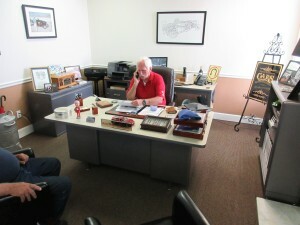 The two hour connecting flight put me in Nashville at around 11.30pm on Wednesday June 7th, six days before we were due to load up and head to Beech Bend Raceway. I was to be a guest of the Hope family and a very weary Brian came and found me amongst assorted travellers at baggage carousel number three. Within an hour I had showered and was fast asleep. Lucky breaks are usually something that happen to other people but in our case, meeting the Hope Clan was an exception. Simply stated, they're a class act. The 'can do' attitude that forms part of their DNA makes our job a lot easier and to say it's refreshing is something of an understatement. 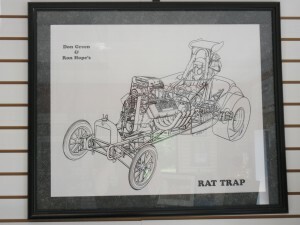 By 9.30am on Thursday morning I'd had a quick 'McBreakfast' and been given a comprehensive tour of the workshop that is Rat Trap HQ. By 9.35am, prep work for the Beech Bend race had begun. 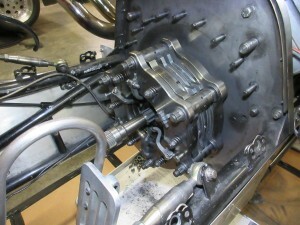 The clutch pack, wheelie bars and fuel tank were quite straightforward. 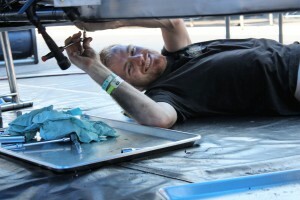 Our Bakersfield driveshaft was a little short but the replacement was perfect. The clutch can has seen over ten years of front line service and took best part of a day to tidy up. Contained within the can is a steel liner. This liner is basically a steel sleeve that covers the clutch and flywheel assembly when the can is bolted to the engine. In the event of a clutch failure, the liner is designed to rotate within the can and absorb some if the energy. Our liner had done its fair share of 'absorbing' and was long overdue for replacement. With the liner removed, repairing all of the threads that anchor the cover plates for both the inspection and adjustment holes was a cinch. The steering issue wasn't too sinister. The steering box was a little loose allowing some movement in the linkage and at some point in the past we lost the tracking. With everything tightened and the geometry reset we were just about good to go. Before we get on to Rat Trap, some explanation of our team mate's current workload is probably justified. 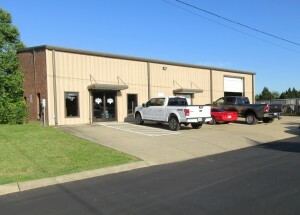 A short time ago, Brian and Rebecca Hope acquired the prestige trailer cabinet company TechnoCraft (www.trailercabinets.com). Since the acquisition, the speed at which the company has developed has left the group a little short on staff. As well as re-fitting the team's trailer for the Bowling Green race, several customer orders had to be ready for the same event. 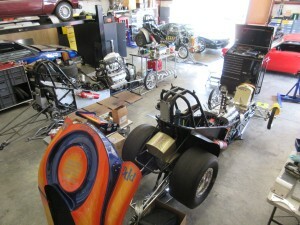 The car we were to race the following weekend was parked at Rat Trap HQ and little more than a rolling chassis. 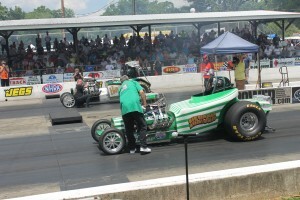 About ten feet away from the Bantam, parked on air jacks was our team mate's car. In order to fulfil an exhausting schedule, the team juggle three versions of Rat Trap. At this time, one of the other two was floating across the Atlantic on its way to Goodwood and the third, having recently returned from New Zealand, was making the three day trek from California to Tennessee. 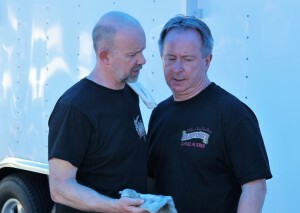 The two drivers towing the trailer were Ron Hopes brother Steve and his long time friend Jim Alvaney. The car had sustained some chassis damage in New Zealand and would not be fit for Bowling Green. Many of the major components would need to be swapped onto the car parked next to ours. 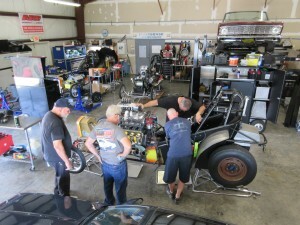 Steve and Jim arrived during Saturday and the team got straight to work. As the weekend wore on, the years of repetition showed. Brian, his son Michael, Keith Dugan, Jim and Steve made the rebuild look effortless and by close of play Sunday, aside from a few details, we had two complete AA/FA's. I don't remember how the conversation started; I probably asked one of them if he'd been into cars as a kid. What followed was the most 'matter of fact' delivery of probably the best gear head movie script I've ever heard. Bonneville, El Mirage, B/Gas Coupe, landing in Vietnam on Christmas Day, returning from Vietnam at the height of the Hippie movement, it just didn't stop. After a while they were swapping stories with each other. Racing a slingshot Dragster on fifty weekends in a single year, eliminator runner up at the last race at Lions, Road Racing at Sears Point, working with Carroll Shelby at Chrysler, test and development driving the Shelby Can Am car, I was spellbound. Like most racers, I've had occasion to hear another competitor recount a notable but modest achievement and turn it into movie. Each time the story is retold, the e.t. gets lower and the wheelie gets higher. For two or three hours I listened to Steve Hope and Jim Alvaney recount their own history with effortless charm, never once trying to score points. That afternoon alone was worth the flight. Nick and Scotty arrived on time and both cars were loaded Tuesday evening. After a light breakfast Wednesday morning, we made the two hour trip to Bowling Green. Wednesday was allocated for trailer parking only. Having already driven through a torrential downpour, we were now becoming aware of why the facility is affectionately known as 'Boiling Green'. The greatest adversary this weekend was clearly going to be the weather. The facility itself is set in beautiful green countryside and oozes character. The pit area is substantial and a large section of it is grass. We had the trailers parked by early afternoon and the Rat Trap team set about delivering the trailer cabinets built during the previous week back at TechnoCraft. As we were quite close to 'home', we had only booked hotel rooms for Thursday, Friday and Saturday. 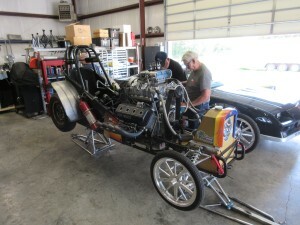 We left for Tennessee late in the afternoon and made our final preparations for the weekends event. We arrived at the track mid morning. We weren't due to run until Friday but there were still a few jobs to do. 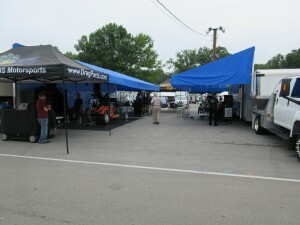 With the awnings set up we unloaded the Bantam and went to work. 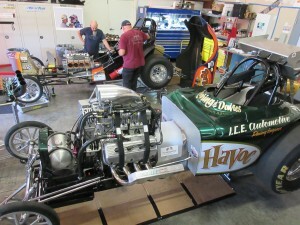 Our International SFI chassis tag lapsed in June so we took the opportunity to get an NHRA version. 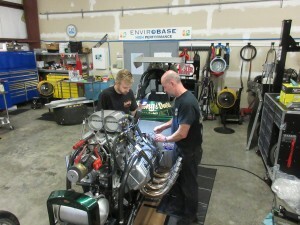 After some detail work on the engine, we cleared tech, Nick mixed up our first batch of fuel and we were done. The technical challenge for us was going to be the weather. We can manipulate almost anything on the car but we can't control the air quality. In broad terms, we base the engines power potential by looking at the 'adjusted altitude'. Obviously the track elevation doesn't change but as the local weather conditions vary, the car thinks it's in a lift. From a performance perspective, as the adjusted altitude goes up, the horsepower goes down. Beyond a certain point, during an ascent, mountaineers often need oxygen, our car has the same problem. To a certain extent we can resolve this issue with engine set up but the general trend is always down. 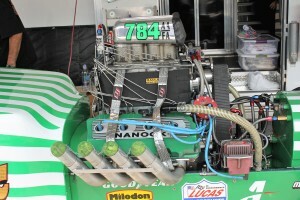 The only tune up data we have for the Bantam is valid between 1,650 and 2,375 feet. The adjusted altitude at Bowling Green stayed between 3,300 and 3,875 feet. After a light breakfast we were at the track by 8.00am. Our first run was scheduled for early afternoon and we were down to run Rat Trap. 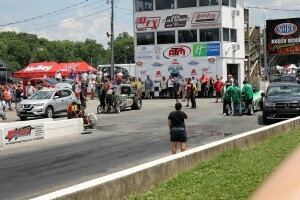 The Fuel Altered format for the event was a four car Match Race. In this environment you have three obligations. One; When you're called you snap on the tow rope and move. Two; You make a run from A to B at an acceptable pace. Three; you don't oil the track. If you can fulfil these requirements, track promoters will take your call. The other two cars in attendance were Randy Bradfords Fiat and the Hough's super tough Nanook. Our warm up went o.k. but if it had been a Cackle Fest, Rat Trap would have been the clear winner. It was jumping off the air jacks. After our tyre roll out issue at Bakersfield, Scott was all over the slicks. He got them to within 3/16" and kept them there all weekend. We were in the lanes by 1.30pm and the heat went to work. Rebecca had previously had a stern word with us about staying hydrated. Scott and I are pretty disciplined at this but Nick is hopeless. He's good with sun block but rubbish with water. The track looked good. It was a tight right turn to get set up for the right lane but nothing too tough. Our first tune up was quite conservative, 86% nitro and a soft clutch. The car dropped a couple of cylinders at the hit but picked them back up about ten feet out, it stayed in the middle of the lane and we kicked off with a 6.46 at 214. We were third quickest but we had the fastest speed. Unfortunately, Ron had some issues on the startline and was unable to make a run. Nick found the return road easily enough and reported that the track was smooth. So far, so good. Back in the pits the heat was starting to bite and nothing on the car would cool down. 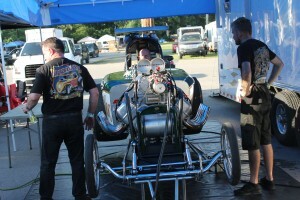 The engine was in good shape and we were a little more comfortable with the track. Our second run later that afternoon would see us run with Randy. Nick brought the fuel mix back up to 89%; we serviced the clutch and got ready for round two. Given the temperature, along with the other three Altereds, we skipped the warm up. By the time we got into the lanes Nick's hydration level was going south, his hands were starting to cramp up and he was struggling to straighten his fingers. It was nothing too dramatic but provided some incentive to tackle the following days water intake with a little more vigour. The run with Randy was quite eventful. Nick left a little early but I doubt that our 6.55 at 224 would have covered the Fiats mid '.40 anyway. The fun came at the finish line when just into the shutdown area we were treated to a big cloud of smoke. Great.... I turned to Scott and indicated that we had work to do. Scott's eyesight, being significantly better that mine, brought the news that in fact the parachutes hadn't opened and that the smoke was off the tyres. I'll be honest; I replied "thank God for that, we don't have to take the heads off." In my defence, although it gets his heart rate up, Nick gets the car stopped. During the early years, before we moved the wing, the parachutes would sometimes deploy into a dead area behind the car and fall onto the wheelie bars. It's not the first time the brakes have had a workout. When we viewed the GoPro footage he'd got the job done with room to spare. By his own admission, Randy earned himself a late steering correction after spending too much time watching Nick sliding towards the end of the shutdown area. We didn't need the logger to tell us what had happened. The car was soft from the startline and when Nick shifted into high gear, the car disappeared in a cloud of clutch dust. We had the fastest speed of the round but we were way short with the clutch. 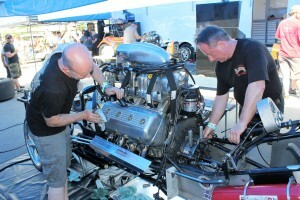 Brian, Keith and the Rat Trap team were firing on all cylinders. Ron carded a 6.37 and dispatched Nanook with room to spare. 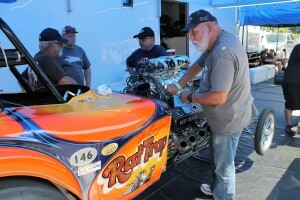 The engine in the orange Bantam looked good as new. Beaten by the sun, we'd left the routine service work normally completed the previous evening in favour of an early start the following morning. 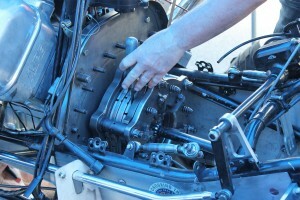 We new that the engine was in good shape but after the run against Randy, we decided on a fresh clutch pack. By mid morning the work was complete; we left the nitro load at 89%, hung some counterweight on the clutch then sat in the shade while the sun did its work. Our first run was again scheduled for early afternoon and would bring us a date with Nanook. Our e.t. 's were fairly even and at that point we were close to 12mph faster. To be fair, our speed advantage probably flattered us a little. For a Fuel Altered, the Bantam was proving to be reasonably well behaved but our fellow competitors were having a pedal or two. Both runs on Friday were in the left lane but as we pulled out of the staging lanes Nick took his first look down the right. The official gave us the nod, I took a quick look across at Dave Hough and Scotty tapped the starter. Over the last few events, the three of us have begun to enjoy the car a lot more, it's not something that we've discussed but it's happening. The car is feels as though it's starting to work with us. When it ran the alcohol Chevy it was fun but the car had a nasty streak, anywhere up to the 800ft mark it would jerk the front end in the air and even after the front eventually settled it would wander around all the way to the finish. The nitro engine was a gamble but has proved to be one that has paid off. 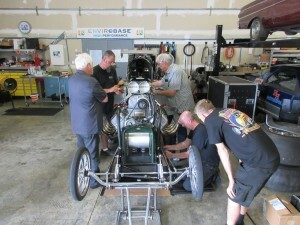 Before the Donovan was installed we looked long and hard at how we could make it more of a race car than an exhibition car and the few mods we made seem to be paying off. It's difficult to quantify and I'm sure every team has its own ideas but for us the number is six successful runs out of seven. Anything below this and we would probably consider our car more suitable for exhibition purposes than a straight eliminator. Burnouts complete it was down to business. With Nanooks pre run adjustments done, I flicked on our Racepak and Rick Hough and I left them to it. Within a few seconds, Vince Generalao turned on the second light and Nick followed him in. After the starter flipped the switch you couldn't separate the cars until the 'chutes deployed at the end of the track. The numbers came up in Nanooks lane first, 6.446 at 224, our side showed 6.449 at 228, aaah' well. Scotty insisted we'd won, I told him that he was dehydrated. At the end of the track, Nick asked who won and I told him it was Vince. It wasn't too tough, it was a great race. Back in the pits the truth emerged and once again, Scotty's eyesight had proved to be better than mine. The five inch diameter 40 watt win light that was perched on top of the light board some quarter mile away had escaped my vision, Nick had scored us a few feet at the startline and we had indeed won our Saturday afternoon race with Nanook. The round was largely business as usual but with one notable exception. 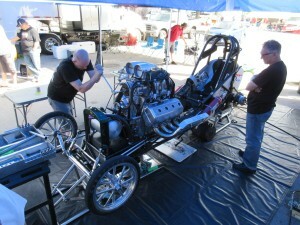 At an adjusted altitude close to 4,000 feet, Randy Bradford had chopped the throttle early and still carded a 6.29. To be fair, Randy and the team had been quick all weekend and if you're looking for 2018 March Meet tip, best you get in now. Our final run of the weekend was to be another lap with our team mates. After lengthy negotiations it was agreed that the losers would buy dinner. 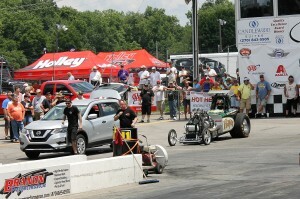 The Rat Trap car was as strong as we'd seen it, the 6.37 on Saturday night was way quicker than we'd been. Nick, Scotty and I had a chat and agreed that as we had Sunday to service the car, we'd knock a couple of teeth off the top pulley and try and score a lobster dinner. Brian was serious and as ever, Ron was laughing like a five year old. Unfortunately, the race proved something of an anti climax. Mid way through the burnout our trusty Donovan quit. It wasn't going to be expensive, the expensive ones have a distinct sound, it was electrical, but it still meant 'Goodnight Vienna'. To his credit, Scotty went for the starter but soon realised that we were done. Rat Trap finished up the weekend with a very respectable mid six and I asked Brian which McDonalds he fancied. 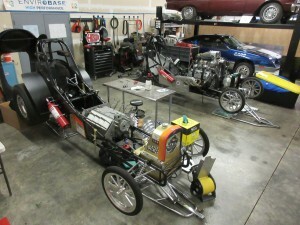 During the day, as competitors were eliminated, the pits at Bowling Green had begun to thin out and by the time our Fuel Altered show had concluded it was close to empty. 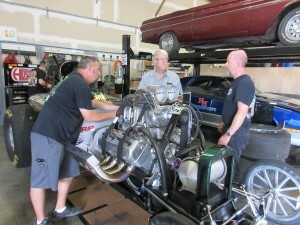 As we were packing up I noticed that the Hough family were busy servicing their Hemi. Impressed with their enthusiasm, I wandered over with some ice cream. Dave had arranged to leave the truck and trailer in the gated compound at Rat Trap HQ. 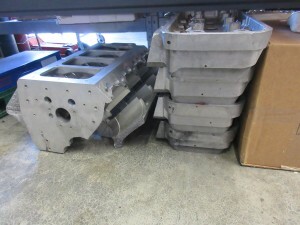 "We're just making sure it's in good shape. We'll fly back Tuesday, it doesn't make much sense to drag it home." 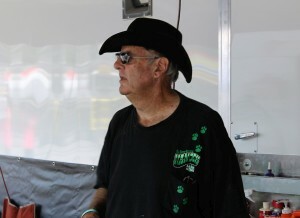 During his fifty something years racing the iconic Nanook, the basic economics of racing a blue chip Fuel Altered haven't been wasted on Dave Hough. 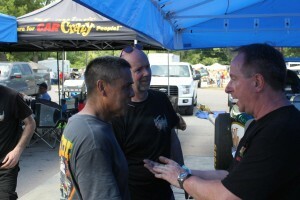 Around 7.00pm, the mile wide grin that was Randy Bradford wandered into our pit and said his goodbyes. The team had arrived with a new fuel system and a desire for progress; the short numbers on the 6.29 were a clear indication of success. Brian declined my suggestion of McDonalds and we ended up at a Barbeque restaurant. Ribs were the order of the day and we were finally allowed to buy everyone dinner. It was a great finish to an even better weekend. Sunday traffic allowed us a pain free drive back to Tennessee and we had the car unloaded by 11.00am. With the collective experience of the Hope team and Dave Hough on hand it took about five minutes to track down a damaged coil. With a replacement fitted in a more suitable location, we fired the engine for a few seconds and then set about draining the oil and fuel. The few hours we had left on Sunday afternoon were put to good use and when we switched off the lights at Rat Trap HQ, the car was just about ready for our first lap at Michigan. We'll catch up again in a month or so. Once again, none of this would have been possible without the generous contributions made by our friends and partners. As always, thanks go to the entire Hope family, Geoff Stilwell at Beech Underwriting, U.S. Automotives Stewart Bassett, the NFAA's Lawrie Gatehouse, The Sherratt family and finally, all the folks at Motorstate, Goodyear, ARP and Lucas.